Every day we hear a different news report on the next best diet.The media knows the word “diet” is like a high pitch whistle to a dog – it gets our attention but at the same time is very irritating. Survey after survey confirms that most Americans want to eat healthier. But we also are confused and frustrated with the fad diets and the generally unhealthy food and eating options they offer. The traditional Mediterranean diet has been consumed by the people living in and around the Mediterranean Sea for thousands of years. The diet is characterized by a high intake of olive oil, fruit, nuts, fresh vegetables, and whole grain cereals; a moderate intake of fish and poultry; a low intake of dairy products, red meat, processed meats, and sweets along with and wine with meals in moderation. How do we Know This Diet Works? The epicenter of this diet has always centered on the country of Greece where studies starting back as early as the 1950s showed that Greeks had the highest average life expectancy and the lowest percent of chronic disease compared to the rest of the world. Since the 1950s thousands of studies have been done both looking at the native peoples who eat the Mediterranean diet and those placed on the diet to improve health and longevity. Studies investigating heart disease have consistently ranked the Mediterranean diet as the most likely dietary model to provide protection against coronary heart disease which is still the number one killer of most American men and women. Is it Too Late to Get Benefits from the Mediterranean? In an intervention study published in February 2013 over 7,000 Spanish men and women whose average age was 67 with a high risk of cardiovascular disease were placed on either a control diet or a Mediterranean diet supplemented with extra-virgin olive oil or nuts for approximately a 5 year period. They found that those placed on the Mediterranean diet supplemented with extra-virgin olive oil or nuts had over 30% fewer heart attacks, stroke, or death from cardiovascular causes. Besides Heart Disease and Stroke Prevention What Are other Benefits of the Diet? Reductions in cancer, depression, high blood pressure, type 2 diabetes, lower cholesterol levels and even Parkinson’s disease has been shown using the Mediterranean diet. It also been linked to improved longevity and along with exercise as part of a successful strategy for healthy weight reduction. In April 2013 a study with 17,000 people found that those that most closely followed the Mediterranean diet had a significantly less likelihood of developing cognitive impairment during the 4 years of the study. What are the Key Foods that make up the Mediterranean Diet? 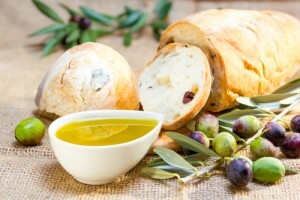 The Mediterranean diet has 35% to 40% of calories coming from fats. This differs from most other heart-healthy guidelines which recommend less than 35% of your calories from fat. But the Mediterranean diet fats mainly come from unsaturated oils which have a protective effect on the heart. Lifestyle factors are also an important part those who live in the Mediterranean countries and benefit from their diet. Increased physical activity, extended social support and stress reduction all part of the Mediterranean way of life which provides additional help to reduce chronic disease and add years to lifespan. Ramón Estruch, Primary Prevention of Cardiovascular Disease with a Mediterranean Diet N Engl J Med 2013.